Patriots vs. Chiefs: Divisional Déjà Vu | NFL News, as it happens, when it happens. Your one stop shop. The last time the Patriots played them, New England came out on the losing end. They weren’t supposed to be the Patriot’s opponents in the divisional round. Out of every possible outcome, this match up was the one that was least favorable. New England can’t sleep on this team. The Patriots have had a bye week but their opponents are still looked at as the scrappy team that will possibly rid the playoffs of the “hated” New England franchise. Do you recognize these statements? These were things said by many NFL analysts and pundits during the 2015 playoff run, but obviously instead of referencing the Kansas City Chiefs they were clearly talking about the Baltimore Ravens. Both the Baltimore Ravens and Kansas City style of play is very different. Last year Baltimore’s quarterback Joe Flacco, although capable of the run was mostly known as a deep ball, pocket passer. The somewhat reliable but inconsistent Alex Smith went all of last season without a passing touchdown and can be a running threat. Kansas City has more of a complete defense where as last year’s Ravens had a subpar secondary. What makes both playoff scenarios so completely different yet so similar? Beyond the obvious, lose and your season is done, the Kansas City Chiefs are the team that the Patriots NEED to face in order to be successful in the postseason. In football, statistics and past performance often mean little when a team can pull it together and play a balanced game. Last year’s Ravens team was a tough and gritty team which constantly stayed ahead of the Patriots and for most of the divisional playoff game, seemed unstoppable. Hall of Fame quarterback, Tom Brady, was able to battle back and help bring his team to victory, after two fourteen point deficits. Beating a team like the Ravens showed that the Patriots were ready for the Super Bowl regardless of the opponent. It was that particular show of determination and resiliency that gave insight to the Championship team the 2014 New England Patriots would eventually rise up to become. This Saturday, the reigning, defending Super Bowl Champions must rise to the occasion once more. The Kansas City Chiefs, as previously stated, are not the Baltimore Ravens of last year. The Chiefs are currently riding high on an 11 game winning streak leaving their five game losing streak feeling as though it were another season entirely. The last time these two teams met seems like a life time ago but rest assured it wasn’t. The famed Arrowhead loss of last year allowed the 2014 Patriots to hit rock bottom. 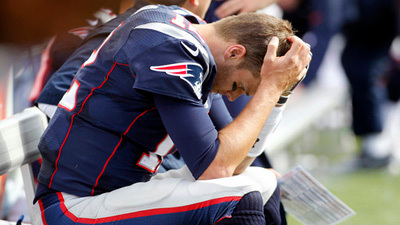 The New England Patriots were beaten, humiliated and left for dead. No matter how special winning last year’s Super Bowl was it doesn’t erase the events of September 29th, 2014 and the horrible fit of despair that day left in each player on that roster. If this year was meant to be the “Revenge Tour” of sorts for Tom Brady and the New England Patriots this is the team they must defeat. The Chiefs annihilation of the 2014 Patriots is an albatross from last year much like the joke that became Deflategate. Call it destiny or coincidence but for things to have played out like they have thus far one thing’s for certain, this is where the Patriots need to be. Had New England gained the first seed they would be challenging a bruised, broken and battered Steelers Team. No this is not the same Pittsburgh team from week one, it would have left no real way to find out what the Patriots were truly made of. The Bengals and the Texans both showed that they were begging for a reason to meltdown. Playing “tomato cans” does not enrich your chances for further offseason success, playing legitimate contenders does. Kansas City is the only AFC team that presents a real significant challenge and a chance to show just how resilient the 2015 Patriots can be. Yes, if the Patriots make it past the Chiefs they still (more than likely) have Denver at their home field to deal with; on paper that is no easy task. Let’s be honest, if the Patriots have both their health and were able to display the resolve to hold off a team steamrolling along like the Kansas City Chiefs, do the inconsistent Denver Broncos truly present that big of a hurdle? Like last year, this game means something much more than just advancement in the playoffs. With Kansas City’s star wide receiver Jeremy Maclin injured, the Patriot’s front seven have the chance to be the difference maker. The Patriot’s offense, if healthier than we are led to believe, can make a statement this Saturday. How the Patriots handle the Kansas City Chiefs will tell us everything we need to know about this team. Other than a potential Super Bowl, this divisional playoff game is the most important game of the Patriot’s season, there is no doubt in the mind of Patriot Nation that they will prevail.